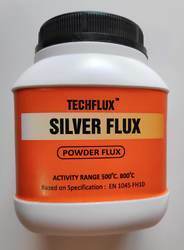 We are manufacturer of flux under brandname TECHFLUX™. Our range of fluxes are made as per various international specifications and we also make proprietary preparation. 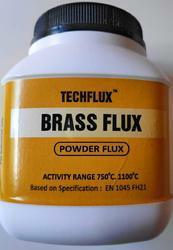 A powder type high temperature flux for brazing/welding of copper, copper alloys, mild & low alloyed steel. Active cleaning power with good flow. Ideal for hot rodding application. Flux Removal : Hot diluted caustic soda dip or wire brush with hot water (60¿¿C) is recommended. Application area : Cycle mfg., Automobile industry, home appliances, furniture industries. A general purpose low melting flux for use when brazing copper, bronzes, brasses, stainless & carbon steels. Its promotes excellent capillary & fluidity for tight fit joints. Excellent in hot rodding application. Can be mixed with distilled water to make a paste. Flux Removal : Hot diluted caustic soda dip or wire brush with hot water (60˚c) is recommended. Application : For use with Silver alloys of BAg group & Copper alloys of BCuP group. 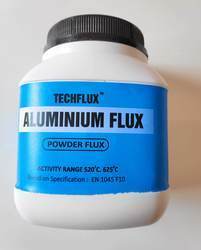 •	This flux is particularly suitable when brazing common grades of aluminium as EC, 11xx, 4xxx, and selected 5xxx alloys. •	A highly reactive flux. •	Can be used on thin aluminium sheets. Flux Removal : Wire brush with hot water (60¿¿C) is recommended. Application : Thin wall thickness auto parts, various aluminium tubular assemblies & components, Aluminium alloys with 12% Silicon. Suitable for torch and induction brazing. EXCLUSIVELY FOR USE WITH ER4047 WELDING WIRE. 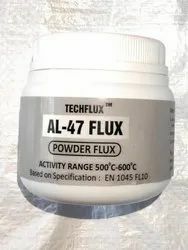 • TECHFLUX AL-47 is a special purpose powder flux which can be used along with ER4047 Aluminium wire to braze Aluminium alloys containing upto 2.5%Mg, 1XXX, 3XXX and 6XXX series aluminium. Thin wall thickness auto parts. Various aluminium tubular assemblies & components. Suitable for torch and induction brazing. Looking for Brazing Flux ?